Warner Bros have announced that Bradley Cooper, Ed Helms and Zach Galifianakis, as well as director Todd Phillips, will all be suffering from yet another hangover, but this will be their last. 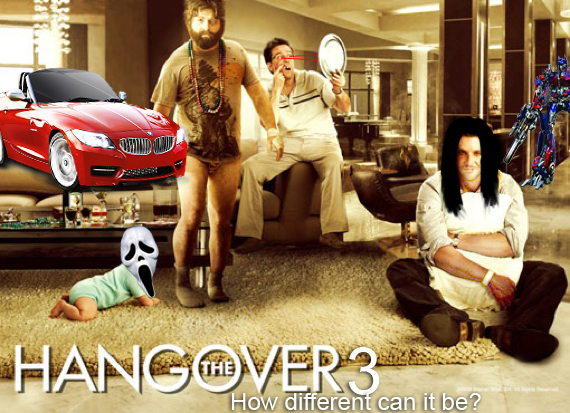 A third film in the Hangover series comes as a surprise to no one, but hopefully the films plot will. One of the main criticisms that the second film faced is that it was basically a repackaged version of the first one, but this time is different. Though we don’t know exactly what has changed, Phillips has said that they’re ‘going to surprise a lot of people with the final chapter’. Maybe this time they’ll get drunk, do a bunch of crazy stuff, fall asleep, wake up with no knowledge of what’s happened and retrace their steps in order to find a lost friend. Or would that be two similar to the first two? Hopefully the last scene in the series will be them checking in to rehab. Wouldn’t it be crazy if they completely changed genre and ended up drag racing cars or facing a serial killer? No matter what trouble the wolf pack get into, cinemas will no doubt be filled with fans, possibly tipsy fans that won’t remember the film the next day. Tipsy or not, you can see the film when it stumbles into a theatre near you on the 24th of May 2013. It may seem like a long wait, but there is a great line up of movies to keep cinema goers occupied until then. What do you think? Are you glad that the cast have returned? Do you like the series? How would you like to see the franchise change? Let me know by voting and leaving a comment below. Also, don’t forget to follow and like the like button. This entry was posted on March 23, 2012 by adamodwyer1. It was filed under Comedy and was tagged with 3, announced, cast, date, hangover, plot, release, return, the.